Aung Kyaw Naing’s death in military custody has triggered fears the government is sending a message that no journalist in the country is safe. The Committee to Protect Journalists estimates that up to Sept 10 this year, 40 journalists had been killed while reporting. The name of Myanmar journalist Aung Kyaw Naing, also known as Par Gyi, who was killed on Oct 4 while in military custody, can now be added to the growing list of the dead. Statistics listed on a page rarely give detail to the hurt felt by the wives, sisters, brothers, sons and daughters left behind to scrabble for answers and meaning to why government violence was used to cut short a life precious to them. Official statements do not convey the terror of being held indefinitely and without explanation in military custody by armed soldiers. Nor do they ease the burden of pain of the wives who are desperate to know what happened to their disappeared husbands. Worried over the disappearance of her husband, Aung Kyaw Naing’s wife, Thandar, spoke to the media on Oct 21, requesting that the military immediately release her husband. She did not know that soldiers had killed Aung Kyaw Naing 17 days earlier. Myanmar’s army released a bizarre six-point statement that attempted to justify the killing of Aung Kyaw Naing three days after Thandar’s press conference and almost three weeks after his killing. The army’s statement alleged that he was a member of a Karen armed group and that he had been killed as he attempted to escape while “trying to seize a gun from a security guard”. The army’s statement confirmed that Aung Kyaw Naing was arrested near the Mon town of Kyaikmayaw on Sept 30 by a combination of police and soldiers from Infantry Battalion 204. He was later taken for “interrogation” to Infantry Battalion 208 and the statement said that “the dead body was properly buried near Shwe War Chong village”. The statement confirmed that Thandar had gone to Infantry Battalion 208 seeking information about her husband’s disappearance. 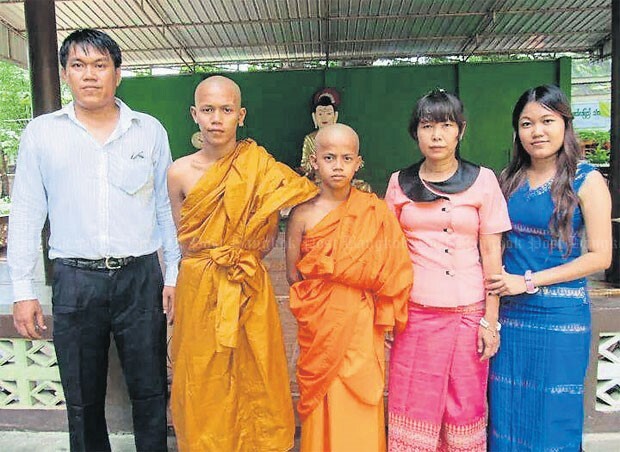 The statement said that its “Division Military Command will inform Ma Thandar about the case” — she is still waiting. To Aung Kyaw Naing’s family the government’s callous behaviour confirms the army is concealing how and why he had been killed. But it is not only the family who are concerned about the possibility of a cover-up. The Committee to Protect Journalists last week issued a statement condemning the death of Aung Kyaw Naing. Reporting Myanmar is fraught with problems. Until recently, the country was regarded by international media groups as one of the world’s worst for freedom of the press. Journalists had to adopt pen names on their stories, as they feared draconian reprisals and decade-long jail sentences from the military regime. In 2007, the Committee to Protect Journalists ranked Myanmar the world’s second-worst country for media freedom, just in front of North Korea. And in a report in 2008, Human Rights Watch fingered Myanmar as one of the “most repressive countries on Earth in terms of its restrictive press laws and its frequent practice of jailing journalists”. In recent days as Aung Kyaw Naing’s story gained traction, a host of rumours started to circulate questioning his role as a journalist. The army’s statement alleged that Aung Kyaw Naing had confessed to being involved in the conflict and that he was a communications officer with the Democratic Karen Benevolent Army. The army’s statement built on the supposed confession and attempted to muddy the waters further when it alleged that Aung Kyaw Naing was a member of the Karen armed group. Working from rumours, young Myanmar reporters flocked to the DKBA headquarters last week to question whether Aung Kyaw Naing was indeed on its payroll. In an interview with Spectrum, Maj Gen Kyaw Tet strongly denied that Aung Kyaw Naing was a member of the DKBA. Maj Gen Kyaw Tet said that 19 years of being allied with the Burma Army had given him insight into the way it works. When the content of the army statement was read out to Maj Gen Kyaw Tet, it produced disbelief and ironic laughter from DKBA officers in the room. The Myanmar president’s office said in a statement on Thursday that it had referred Aung Kyaw Naing’s death to the “Myanmar National Human Rights Commission to make an inquiry according to laws defined in Myanmar National Human Rights Commission Law and to submit a special report surrounding human rights [on this case] to the president’s office as soon as possible”. Aung Kyaw Naing’s sister, Chaw Chaw Kyi, said she had little faith in either the commission or the president’s office to be independent about the killing. She also noted that the press release took the opportunity to repeat the lie that her brother was an communication officer in an armed ethnic group. In a small, neat side street in the Thai-Myanmar border town of Mae Sot, Aung Kyaw Naing’s living space remains as he left it before embarking on his ill-fated assignment to cover the armed conflict between the government army and the DKBA. Aung Kyaw Naing’s family are dismayed at what they claim are attempts by the government and some Myanmar media outlets to smear his name by insinuating he was bought off by the DKBA. The family point to the spartan conditions of his living quarters as evidence that he was not taking money from any group. Chaw Chaw Kyi fussed with a faded blue curtain that had provided her brother with some measure of privacy from the nearby street as she spoke to Spectrum. Aung Kyaw Naing’s living space takes up a small section of a covered carport at the front of a house. A shaky cupboard and a converted bookcase shields a single bed and thin mat from passing eyes. The shelves are neatly stacked with clothing. A towel lies folded on the bedhead. A computer, well past its used-by-date, sits on a wood veneer desk. Facing the street and behind the cupboard, Aung Kyaw Naing’s much loved but beaten up motorbike sits waiting. Chaw Chaw Kyi’s face showed the strain. She was close to tears as she tried to understand what has happened. Her daughter, Hnin Wati Nwe, stepped to her mother’s side and comforted her with a hug, and described how she heard her uncle was dead. Chaw Chaw Kyi wiped her face with a blue cloth, took a deep breath to compose herself and explained how she was finding it hard to come to terms with the loss of her brother. Hnin Wati Nwe, 21, opened her tablet to show a message and a photo Aung Kyaw Naing had sent to her just before his death. Chaw Chaw Kyi pointed out that her brother was not worried about covering the conflict and dispelled a rumour that he was ethnic Karen and had links to the DKBA. Hnin Wati Nwe clicked her way through folders on Aung Kyaw Naing’s computer. Photographs flashed on screen of Aung San Suu Kyi and other iconic figures of Myanmar’s political opposition that he had taken. A portfolio of stories and photos published in a wide range of Myanmar newspapers and broadcast media appeared on screen, giving lie to the accusations that Aung Kyaw Naing was not a journalist. A Myanmar journalist pulled out of an interview for this story at the last minute, saying that his management was concerned that he was talking too much about Aung Kyaw Naing. The family are comfortable that Aung Kyaw Naing had careers as both an activist and a journalist and Chaw Chaw Kyi is straightforward in her assessment of her brother’s attitude to his work. Outside in the small soi children hit and chase a shuttlecock — laughing and shouting, in stark contrast to the sombre mood in the house. A ponytailed man stops by the house, introduces himself as Pay Toe, and explains his relationship with Aung Kyaw Naing. Pay Toe said Aung Kyaw Naing’s friends are angry at the government’s disregard for the family’s plight. Pay Toe believes his friend’s killing was meant as a stark warning to journalists. “Journalists are not scared, but the government is because everyone in Myanmar is now demanding the truth and they know journalists will do it. Chaw Chaw Kyi agreed with Ko Bo Kyi and AAPP’s position on her brother’s death, and is angry that the military’s statement attempts to cover-up what really happened. Chaw Chaw Kyi said the killing can be taken as a warning to all journalists. A quick search of the internet produces a long list of credible international and regional human rights organisations that have documented and verified widespread and systematic violence and abuses by the Burma Army in eastern Myanmar. It includes Amnesty International, Human Rights Watch, Fortify Rights, Harvard Law School, the Border Consortium, the Karen Human Rights Group, Free Burma Rangers and the Assistance Association for Political Prisoners (Burma). The Committee to Protect Journalist’s Mr Crispin told Spectrum he is troubled that the government is trying to hide what really happened to Aung Kyaw Naing. Mr Crispin said the CPJ was calling for an independent investigation into the killing. *This article appeared first on Spectrum, Bangkok Post on 2 November 2014.